"When an indoor cat spies a bird just outside the window, it crouches at the window, tail lashing back and forth, and sometimes it makes a stranger chattering sound. Scientists don''t know why cats make this noise. Some think the feline is showing its frustration at not being able to get at its prey, while others think the cat is expressing its excitement at spotting the bird." For whatever reason they do it, those who own and love cats have likely heard that sound. 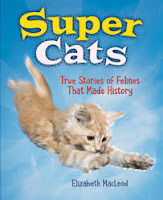 As she always does, Elizabeth MacLeod has done a great deal of research for this wonderful new book that will please young readers who have an affinity for felines and for heroes. The design of the book and the many photographs that adorn its pages will keep those readers engaged and entertained for hours. There are nine chapters: Cool Cats, Cat Gods, Bad Luck Cats, Good Luck Cats, Inspiring Cats, Feline Hunting Machines, Working Cats, Spy Cats, and Cats That Help Heal. I went right to finding about cats that help and heal, having read previously about Doctor Oscar and wanting to know more. "Oscar patrolled the length of the floor, stopping to sniff in a few doorways, sitting down in some, and trotting right by others. When he'd finally checked all the rooms, he leaped up onto a stack of files at the nursing station, closed his big green eyes, and curled up for a nap. The nurse relaxed. Now that Oscar had done his round and checked all the patients, she knew they'd be safe for the night." Oscar had proved to the staff that he had an uncanny ability to recognize when a patient would pass away. He would stay near that patient in the last hours of their lives. Amazing! I learned about therapy cats, watched suggested cat videos, learned more about Oscar, lifesaving cats, and even a cat nurse. And I had only read one of the nine chapters. There is much to read, to admire and to learn as kids take the time to share this book. It is a journey through history, and shares some outstanding information. 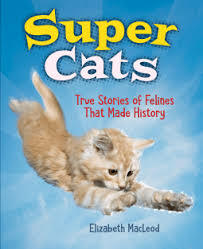 Each chapter begins with a tale told from the perspective of a cat, followed by many information boxes, sidebars, and other nonfiction features. Ms. MacLeod follows up with a timeline, a list of places to visit, a source list and ideas for further reading. Cat lovers are going to love this one!